"Yummy street food from Indore, India. You can increase or decrease the spices based on preference. 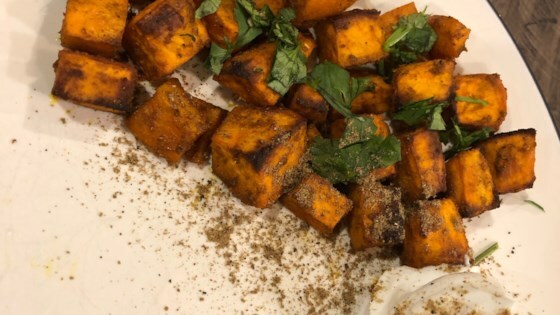 You can experiment with butter/dried cilantro/garlic powder, or top baked yams with fresh chopped cilantro. Serve hot." Bring salted water to a boil in a pot. Add yams; cook and stir until slightly tender, 5 to 8 minutes. Mix oil, cumin, chaat masala, amchoor, turmeric, chili powder, salt, and pepper together in a container with a lid; add yams. Cover; shake until coated. Marinate 20 minutes to 2 hours. Preheat oven to 350 degrees F (175 degrees C). Transfer yams to a baking pan. Bake in the preheated oven until yams are tender, 25 to 30 minutes. If desired, 2 more yams can be added. Chaat masala can be found in an Indian store. Sweet potatoes can be used instead of yams. If using sweet potatoes, cooking time is lower, about 3 to 5 minutes. The longer you allow the yams to marinate the stronger the flavor will be.